This set of Python Interview Questions & Answers focuses on “Mapping Functions”. Explanation: The list should be the second parameter to the mapping function. Explanation: Each element of the list is incremented. Explanation: A NameError occurs because upper is a class method. Explanation: Each element of the list is converted to uppercase. Explanation: A list of Nones is printed as to_upper() returns None. Explanation: A map object is generated by map(). We must convert this to a list to be able to print it in a human readable form. Explanation: A TypeError occurs as map has no len(). Explanation: The outer list has two lists in it. So it’s length is 2. 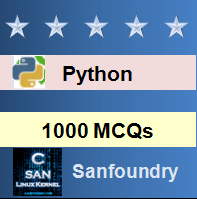 To practice all interview questions on Python, here is complete set of 1000+ Multiple Choice Questions and Answers.